Lot of 2 transistor AM portable radio parts sets. Magnavox AM-801 Japan & Motorola XP34GN Hong Kong. They both appear complete. As-is. Item #6718 . . Lot of 2 transistor parts sets. OMGS 1000 (Japan) & IC Power (Hong Kong). Sold as-is. Item #6727 . 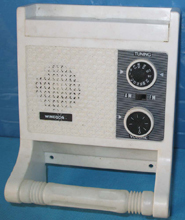 Fiesta KP-6TR 6 transistor AM radio. Hong Kong. Overall appearance is very good. No cracks or chips in the white plastic case but it needs some cleaning. Gold plated grille is very good. Light yellow back is very good. Coin slot is excellent. Chssis very clean. Completely dead in a brief test. Includes original box in very good condition. Requires one 9 Volt batt. Approximate size in inches 2 638W, 1.155D, 3.985H. Item #2801 . Windsor Toilet Radio AM/FM radio, transistor. China. Overall appearance is very good. White plastic case will be excellent when cleaned, no cracks or chips. Original operating instruction included. Easily tuned a couple stations in a brief test of AM & FM, great volume. Novelty. Requires one 9 Volt batt. Approximate size in inches 6W, 3D, 9H. Item #2861 . REALTONE transistor radio. Overall appearance is VG. Grey plastic, tape residue on back. Japan. Screw that holds vol knob on is broken. Not tested. Item #2898 . Pepsi Can novelty transistor AM radio. Hong Kong. Overall appearance is very good to excellent. Label needs only a little cleaning. Metal perf grille is very good to excellent. Bottom very good. Very clean inside. Not working. Requires one 9 Volt batt. Approximate size in inches 2.6W, 4.75H. Item #2916 . 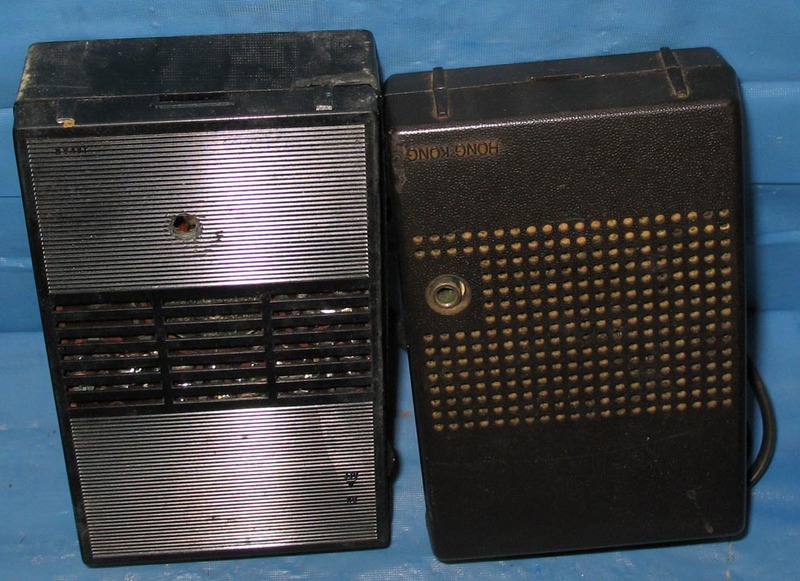 Realtone 9 transistor AM radio. Japan. Overall appearance is very good. Ivory plastic case & back are pretty dirty but have no cracks or chips. akelite case but it needs a good cleaning and polish. Coin slot is very good. No label. Chassis, including battery contacts, is very clean. Got volume control induced static in a brief test but unable to tune a station. Requires one 9 Volt batt. Approximate size in inches 2.615W, 1.162D, 4.70H. Item #3092 . Megatech HP1000 Mini Headphone AM/FM radio. China. Overall appearance is very good to excellent. A few minor scratches or wear in paint but no cracks or chips. Dials & markings are excellent. Foam earpieces are not deteriorating. Not working, may be caused by minor battery corrosion. Novelty. Includes original box & instructions in very good condition. Requires 2 AA batts. Approximate size in inches (each earpiece) 1.85W, 0.87D, 4.275H. Item #3461 . PANASONIC RF700 Overall appearance is Very Good to EXcellent. Chrome/black plastic. AM/FM. AC/DC. Not tested. Japan. Approximate size in inches 4.7H, 8.1W, 2.1D. Item #3488 . 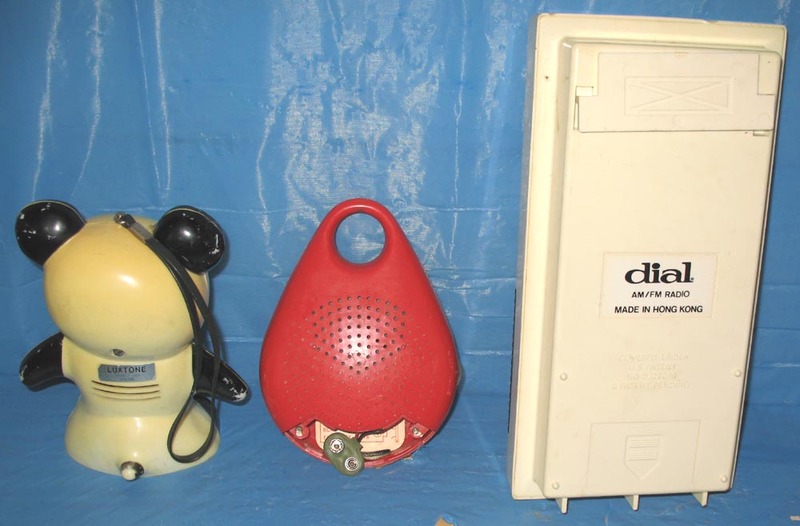 Riveria RV62 6 transistor AM radio. Americana Industries Ryuku. Overall appearance is very good. Light gray plastic case needs cleaning & polish but no cracks or chips. Silver perf metal grille is excellent. Silver trim above it should cleanup to excellent, no pitting. Black back is very good, minor scratching. Coin slot is excellent. Label inside is very good. Chassis very clean. Not working in a brief test. No sound at all, needs earphone jack cleaned? Requires one 9 Volt batt. Approximate size in inches 2.65W, 1.225D, 4.275H. Item #3708 . 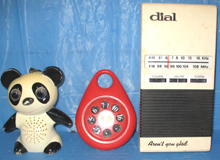 Playschool " Robot Radio " FM transistor radio. China. Overall appearance is very good. Needs cleaning but I see no flaws in case back or anywhere. Battery compartment is very clean. Easily tuned several stations in a brief test. Requires one 9 Volt batt. Approximate size in inches 3.33W, 1.25D, 6H. Item #3767 .